I wanted to photograph some fall color. Landscape images, which have captured my interest for decades, weren’t quite floating my boat. I wanted something different, but wasn’t quite sure what that might be. A friend invited me to join him to photograph autumn foliage in East Lansing, Michigan. The colors were beautiful, but gusty winds made it difficult to capture the detailed and clear images I sought. Due to the weather conditions, I decided to make it a play day. I threw away any agenda I might have had. Instead of holding myself to preconceived notions, I allowed myself to explore in artistic ways that were different from my norm. Instead of fighting against the gusts, I decided to work in concert with them. Detailed and clear shots were no longer my objective. I now was going to work with intentional blur. I tried a range of slow shutter speeds. My aesthetic objective was to achieve an impressionistic effect. 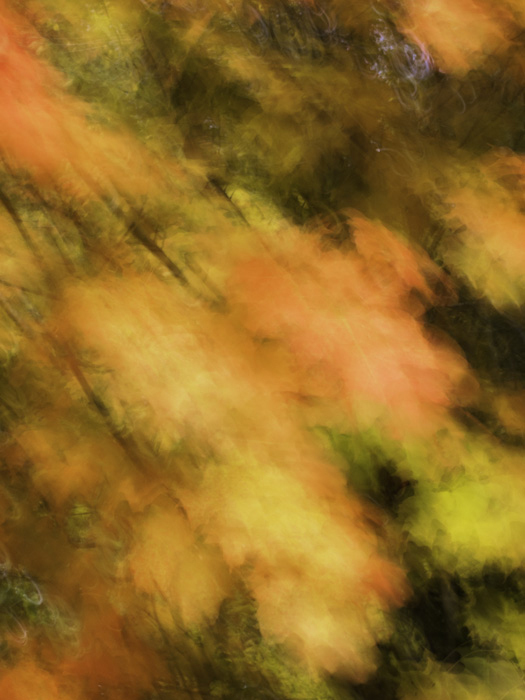 I experimented with holding the camera still while the leaves blew around. I also explored the effects of moving my camera to simulate movement. Ultimately, I found that I liked images best when the branches were sharp and clear while the leaves were, to varying degrees, blurry. I found an arrangement of branches that I liked. Then, blocking out the sky and all other visual distractions that I could, I focused my efforts on framing a field of red and orange with an interior structure of diagonal branches. Some of my images were only slightly blurry. Others were so blurred that all discernible tree and leaf features vanished into a wash of color. And some photographs roughly split the difference between these two. In the end I liked the middle option best. This day of shooting taught me some very important lessons. I learned that it can be good to let go of preconceived ideas. It can be productive to literally “go with the flow.” There was no benefit to fighting against that which could not be changed (gusty wind conditions). By being open to the moment, I created some images that were unusual for me. I have used them in classes where I teach about Buddhism and the principle of impermanence. This day, more than many others, taught me that play is a valuable attribute for a photographer—and that through play and experimentation doors can open for our art to enter new and exciting phases.